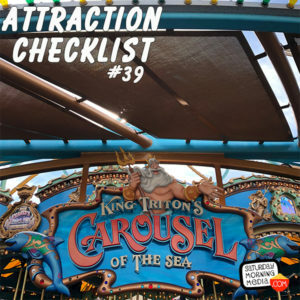 http://www.attractionchecklist.com – This episode Suzie and I head back to Disney California Adventure to take a spin on King Triton’s Carousel of the Sea. Recorded on November 26, 2017. On this episode we head back to Disney California Adventure to take a spin on King Triton’s Carousel of the Sea! Located in the Paradise Pier, soon to be Pixar Pier section of the park, the guide map describes this attraction in the following manner: Ride a whimsical Carousel of Sea Creatures. There are no age or height requirements for this attraction and the Thrill Level describes this ride as a spinning slow ride. Before we climb aboard our sea creature, here are five fast facts about King Triton’s Carousel of the Sea. 1. King Triton’s Carousel of the Sea opened with Disney California Adventure on February 8, 2001. 2. The carousel features 56 sea creatures to ride on and two water chariots. 3. There are 7 different types of brightly colored sea creatures to ride on. These include sea otters, dolphins, flying fish, sea horses, whales, sea lions and Girabladi Fish. 4. Each of the sea creatures is carved and painted by hand. 5. Along the edges of the carousel’s canopy there are 16 icons depicting famous California seaside amusement parks. These include Santa Monica Pier, Ocean Park Pier, Loof’s Pier and Playland at the beach. So let’s take a ride on King Triton’s Carousel of the Sea as it is today. Along for the ride is Suzie and after we’ll discuss our thoughts on this classic ride as this is my first time on the attraction. This is a binaural recording, so if you have headphones put them on now as we experience King Triton’s Carousel of the Sea at Disney California Adventure!